The new VW Tiguan is wider, longer and shorter than its predecessor. The compact SUV's clean lines and dynamic stance give it a sporty look, VW says. Volkswagen has made its new Tiguan lighter, roomier and added more technology as standard equipment in a bid to keep the car among Europe's top-selling compact SUVs. Last year the Tiguan ranked second in the segment behind the Nissan Qashqai. The Tiguan is the first VW Group SUV to be based on the automaker's MQB modular architecture, which enabled the company to reduce the SUV's weight by 50kg despite adding comfort and safety equipment weighing 66kg. VW first launched the Tiguan in 2008 and it quickly became popular thanks to its mainstream design, above-average quality, good packaging and wide choice of fuel-efficient engines. Despite booming SUV sales, VW executives realize that it will be a challenge for the second generation to continue the success of its predecessor because there is much more competition. The Tiguan had six rivals when it debuted. "Today we count almost 30 competitors," said Karlheinz Hell, VW's compact line head. The Tiguan’s standard safety equipment includes automatic braking to avoid or reduce the severity of a low-speed crash; a braking alert if the car gets too close to a vehicle in front; and a system that stops the car after a collision to avoid pileups. A head-up display and 360-degree monitoring of the area around the car are first-time options for the Tiguan. The Tiguan's rivals now include not only new mass-market SUVs and crossovers such as the Renault Kadjar but premium rivals including the BMW X1, Mercedes-Benz GLA, Audi Q3 and Q2. The soon-to-be launched compact SUVs from VW sister brands Seat and Skoda, which also will be built on the MQB platform, will add two more in-house rivals. 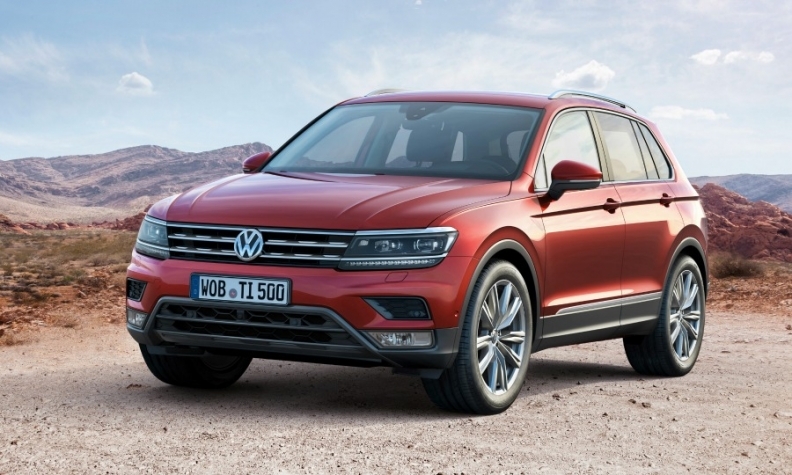 The Tiguan will have a seven-seat variant for the first time for the U.S. and China. Infotainment: The Tiguan offers VW's so-called Active Info Display multi-functional instrument cluster already available with the Passat midsize family and many Audi models. Its on-board electronics can integrate Apple and Android smartphones and tablets. This is done via apps. Engines: The Tiguan’s engines are more powerful but up to 24 percent more fuel efficient than the outgoing range. Four gasoline engines will be offered globally. Four diesels as well as gasoline units will be available in Europe. A plug-in hybrid with a 50km electric range is due in 2017.